Temperatures are dropping, overnight frosts are setting in and morning road ice is appearing. Working at height in winter can mean working in harsh conditions with wind, ice and snow all added hazards for industries carrying out work at height. MEWPs (mobile elevated work platforms) are not only designed to be safe and fully functional in bad winter weather, but are used for essential maintenance tasks in towns and in the countryside to keep things running. 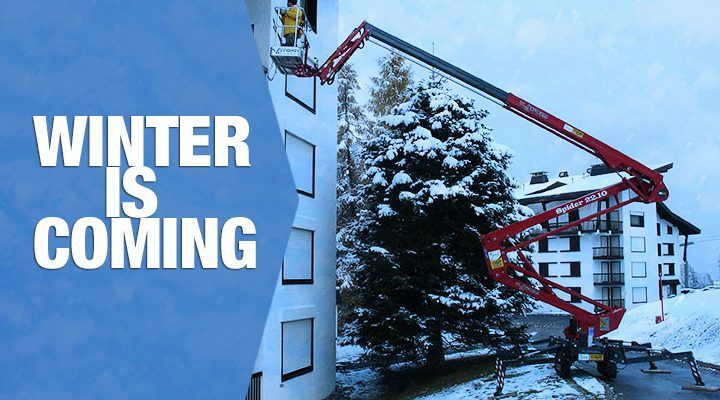 Working at height in winter can increase the health and safety risks for workers and create additional access problems. All-terrain powered access platforms are designed to minimise the risks and challenges posed by working at height in winter weather conditions. With their tracking spreading the weight of the equipment, it’s easier to reach hard to get to places, on and off road, in a safe and stable way. Both tracked and four-wheel drive MEWPs are designed to reach higher in demanding work environments. They are lightweight and agile, with some four-wheel drives having different steering modes, and so are more mobile and easy to use on rough terrain. With an articulated riser and telescopic boom they make it possible to reach over obstacles, such as fallen trees or snow drifts, and sophisticated levelling mechanisms keep them stable and safe to use even when set up on severely sloping terrain. Even in the world’s most extreme weather conditions, powered access platforms are relied upon to get the job done. Specially adapted platforms for working at height in winter are available. Snow tracks, specialist oils and hostile environment kits have been used in Antarctica for construction on the compacted snow and ice of the Brunt Ice Shelf. • Airports rely on powered access to de-ice planes before take-off which prevents additional flight delays. Ice can build up on the wings and structure of the plane creating a drag effect or even preventing take off. Powered access platforms are used to spray the plane with a de-icer that works at temperatures way below freezing, though high pressure hoses. • Powered access is essential for making streets and built up areas safe in extreme weather conditions with essential maintenance such as removing icicles from the roofs of buildings which can be hazardous if they fall, clearing guttering and mending roofs that have been damaged by wind or icy conditions. • Rescue situations and emergency services, including mountain rescue and the fire brigade, rely on powered access to manage situations quickly and safely even in bad weather. These are just a few of the ways that powered access platforms are used to keep the country going in the harsh winter months. They are designed to cope with the harsh demands of winter weather conditions on and off road. With the ability to be stable and safe and access difficult areas, even in the face of obstacles, they are vital to safety in the working and living environments. Please feel free get in touch if you would like more details. Alternatively our friendly staff are always on hand to answer any questions that you may have on 01226 716657. To get people, tools and equipment to heights safely and quickly, there are times when traditional working solutions can limit productivity. Powered access platforms offer a flexible way to reach jobs at height – they are fully mobile and can access areas with restricted space, improve site safety, and save money. Different types of powered access platforms can support a range of industry sectors from cleaning windows, to construction sites, to saving lives. Powered access platforms can be transported, set up and utilised quickly and easily with flexibility, depending on the demands of the job. Larger platforms can be road towed for set up on site, or vehicle mounted platforms offer maximum portability. Some models have the ability safely while the platform is raised; a major benefit for completing multiple jobs in different locations on or off site. For tighter spaces or building interiors, spider lift access platforms are lightweight with low ground pressure. They can be used internally or externally without damaging floors or pathways and will fit through standard sized doorways and gates. Even jobs in extreme conditions are accessible with all-terrain vehicles that have four wheel drive and four wheel steering options to access hard to reach places, and levelling controls that stabilise on steep sloped ground. Powered access platforms are a simple solution for lifting both people and essential equipment at height. Heavy tools or materials, specialist equipment or breakables are raised safely and quickly. Industry standards regulate the manufacture and maintenance so they are easy to operate and robust. Training in the use of access equipment is required by law but will benefit businesses in the long run as the equipment will be used quickly and efficiently by a small number of staff. Even road towable boom lifts have an on-board drive system. They are put in position by one person to reach heights of 10 to 26 metres. In most jobs, time is money and powered access platforms will save money by improving speed and efficiency. They are convenient and safe, reducing time spent on risk assessments and setting up equipment, such as scaffolding, onsite. They require less staff to operate them, saving on labour costs, and are flexible and easy to move mid-job. They can also lift heavy weights and specialist equipment that might be costly to move around using traditional lifting methods. Whether you are looking to buy or hire the equipment, powered access platforms, are mobile, safe and flexible. They resolve a number of issues posed by traditional lifting methods. These include access to tight spaces, hard to reach areas, health and safety considerations and value for money. Whatever the size and location of your job, they are easy to operate and install, safe to use and can cater for a range of needs and requirements for different business that work at height. Urban areas and town centres are always evolving and changing. They require on-going maintenance by contractors and local authorities which is often aided by powered access platforms. Many of these jobs are at height and need to be carried out in the fastest and safest way possible to avoid disruption for people and businesses, and minimise the risk to operatives and pedestrians in built up areas. • Construction – building sites use access platforms for jobs including roofing, tiling, windows and services. • Maintenance – Powered access platforms are used to carry out repairs and servicing to street lighting, clearing gutters, fixing roofs, window cleaning and to complete other general repairs. • Rescue situations – The fire service depends on powered access platforms to help them save lives. This could be reaching high windows to get people out of a burning building or even a lift with a hose to target water at specific areas of fire. Many of the platforms can carry heavy weights and multiple people and reach significant heights quickly and safely. • Tree surgery and landscaping – Trees need to be kept under control to avoid the dangers of falling branches or poor visibility for vehicles and a powered access platform is not only quicker but much safer and less exhausting than climbing a ladder to reach the top of a tree and then use a chainsaw. They are also used to clear steep verges and embankments of vegetation and debris. 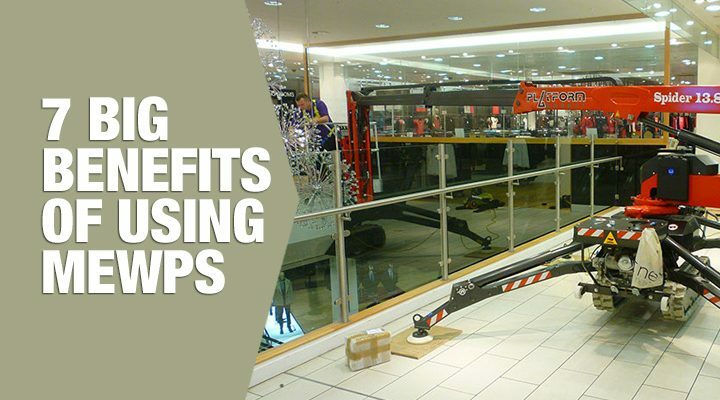 Powered access platforms keep town centres and urban areas running efficiently and safely. They are essential for both new buildings and development and for taking care of the existing properties and infrastructure. Flexibility in terms of access and mobility, bearing weight and avoiding obstacles, means most jobs at height in urban areas can be completed safely and quickly without causing a major disruption or putting lives at risk unnecessarily. 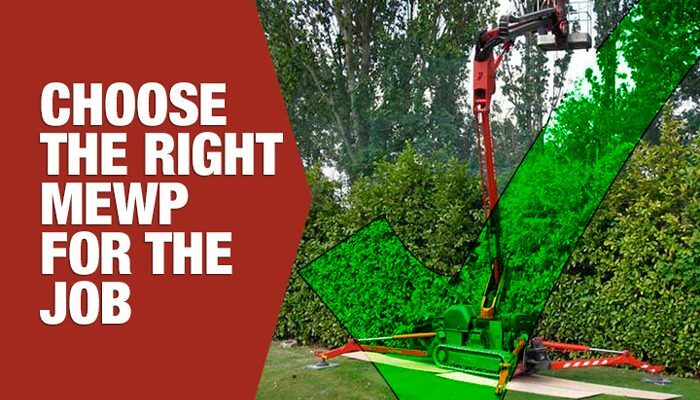 Powered access platforms offer a safe and speedy solution to reach most jobs at height but with a wide variety of machinery specifications, it is important to be mindful of a few things whilst finding a MEWP for the job. Different types of access equipment have been specially designed for jobs in certain environments, for example, spider lifts can be used on fragile floors and in confined spaces whilst road/rail access platforms have a dual functionality to run on the road and train tracks. Getting it wrong can not only slow a job down, costing time and money, but could increase the health and safety risks to the workforce and public as well. A site visit to the job location is essential to determine which high access equipment to use. • Are there any steep slopes? • What are the ground conditions like? • Are there obstructions such as steelwork, overhangs or power lines? • What space is there to load at floor level? • How high up is the job? • Are there height and width restrictions? Access platforms are flexible and can lift people and equipment to the necessary height in less time that it takes to climb a ladder or scaffold and winch up the necessary tools. Mobile access equipment which is mounted on a vehicle or truck is ideal for multiple jobs in one location. Often powered access platforms can access jobs which are hard to reach or dangerous with traditional scaffolding or ladders. Boom lifts have a telescopic reach which can avoid obstacles such as architecture or overhanging branches. Spider lifts are designed for use in confined spaces, including jobs indoors, and can pass through a standard sized doorway. Consider the potential for falls and whether you need any additional safety equipment such as guardrails, nets or safety harnesses. Make sure the people operating the access equipment are fully trained to do so. 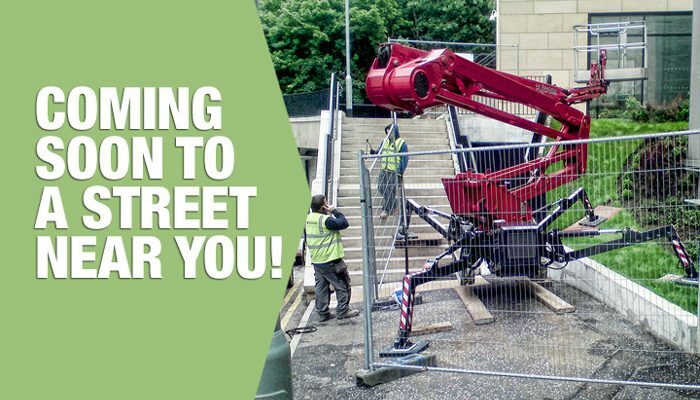 If you are still unsure about the best powered access platform to use for your job then ask for advice at the place where you plan to rent or buy from. Whatever machine you select, it is important to familiarise yourself with the specific make and model. Choosing the right access equipment will make a big difference to the speed and safety of your job.